Get your Financial Fitness ON this Summer with LendingPoint! Look good on the outside, feel good on the inside and put money in the bank. We all tend to shop like crazy on the weekends and spend money on things out of sheer boredom. Instead, why not get physically and financially fit? We know what you’re thinking. This sounds too good to be true. The good news is that we are being totally FOR REAL. Instead of a movie with popcorn, go hiking and plan a picnic when you reach your destination. This is super relaxing, and active. Plus, you won’t spend $20 on lunch – if you make it at home for free. Bike ride through the park. Use your sense of adventure and explore different parts of your beautiful city (please be cautious of your surroundings) and save $10 to $20 of gas by using your feet instead of your gas pedal. Don’t forget to bring lots of water! Plan a scavenger hunt with a group of friends or family. You can place the hunted items all over your neighborhood, local park, or local downtown. This is free and super fun. Plus, you get all of your friends and family really moving to claim their spot as winner and you’re not spending $20 on a new pair of jeans (out of boredom). Go to a free local museum. This is family friendly, educational and fun all while keeping you on your feet. Plus, you save $40 on admission price. The average admission for 4-person families in the United States is $9.02 per person. 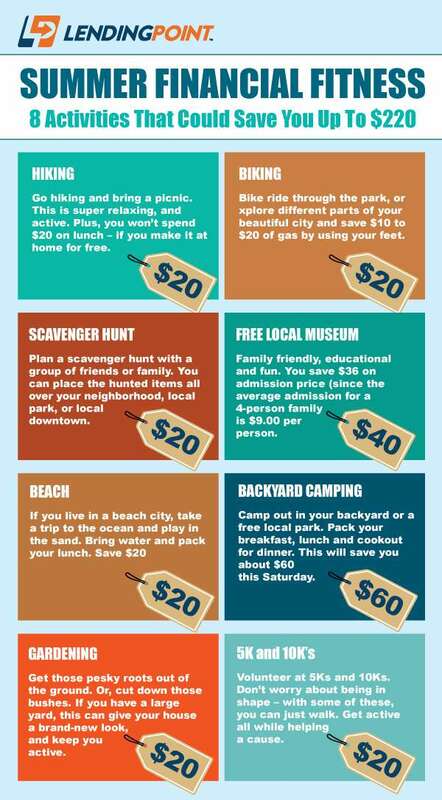 Camp out in your backyard or a free local park. Dust off that old tent and plan a weekend adventure. Pack your breakfast, lunch and cookout for dinner. This will save you about $60 this Saturday. Gardening! Instead of hiring a kid to do it, pull those pesky roots that you don’t like out of the ground yourself and save some cash. Or, if you’re feeling daring, you can cut down those bushes. If you have a large yard, this can give your house a brand-new look, and keep you active. Volunteer 5Ks and 10Ks. Don’t worry – some of these, you can just walk. Get active all while helping a cause. If you liked this blog and want to save $220 this summer, we made this a downloadable calendar for you. Enjoy!